*There's a special session designed specifically for women. www.PassionAndPurposeProgram.com. It has details about her exciting new webinar-based coaching program as well as information to fuel your desire to find and follow your passion and purpose. Be inspired by stories and videos about people pursuing deeply satisfying passions and insights from experts in the field of human potential, passion and creativity. employees or members will never stop thanking you for the great insights and ideas she shared that made a tremendous impact in their professional and personal lives. 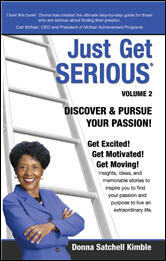 Contact Donna at info@JustGetSerious.com and 770-498-0400. Watch Donna's speech on achieving success.